Segmented wood turning is an intriguing new art form. The basic vase project illustrated and described can be completed in a weekend and requires no special turning equipment or tools, just an easily constructed jig. 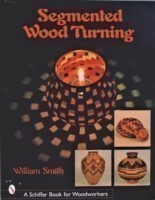 Includes information on wood selection and preparation, jigs, glue, turning tools, finishes, and advanced techniques for making vases, boxes, and sculptural pieces.